Mariya Yaremchuk was born in Chernivtsi on March 2, 1993, in the family of People's Artist of Ukraine Nazariy Yaremchuk. Her father died of stomach cancer when Mariya was two years old. She has two brothers (also singers) Dmitry and Nazariy and sister Vera from mother's first marriage. Mariya sings from the age of six years and is actively involved in the Ukrainian show business, being winner of many competitions and festivals, including - Ukrainian Festival of Arts "Ukraine's future - children" (2003), Prize and the Audience Award. In 2009 , she graduated from high school #4 of Chernivtsi and entered the Kiev Municipal Academy of Circus and Variety Arts named after L. Utyosov on pop vocal department. She also graduated from the Faculty of History and Political Science, International Relations of the Chernivtsi State University majoring in "International Relations". Marya came to prominence with the participation in the project "Golos Krayiny" (The Voice) where she got to the team of Olexander Ponomaryov (participant of Eurovision 2003), reached the finals and won 4th place. In 2012, the singer was the only representative of Ukraine at the "New Wave 2012" festival, where eventually took third place and won the Audience Award. In the autumn of 2012 she introduced the single "So mnoy opyat", written by Konstantin Meladze and Andrei Frantsuz, and a music video for this song. 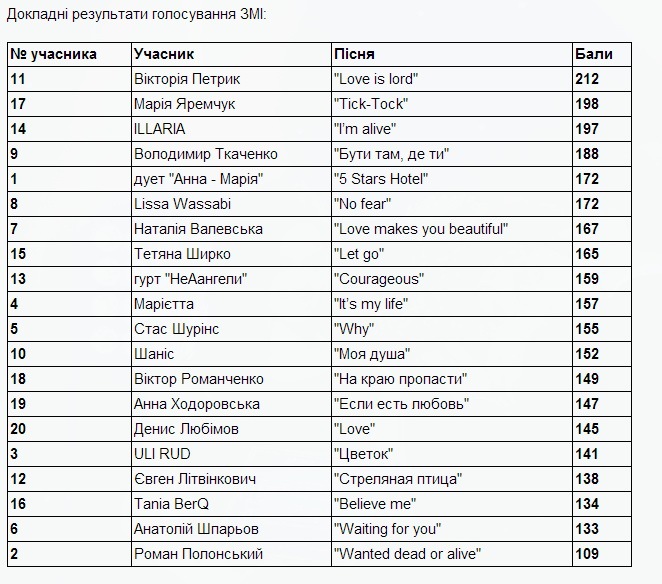 Last year, Mariya has already participated in the Ukrainian national preselection for Eurovision Song Contest with her self-writter song "Imagine", where she took 5th place. In the autumn of 2013 she presented a music video for the single "Tebe ya znaydu". 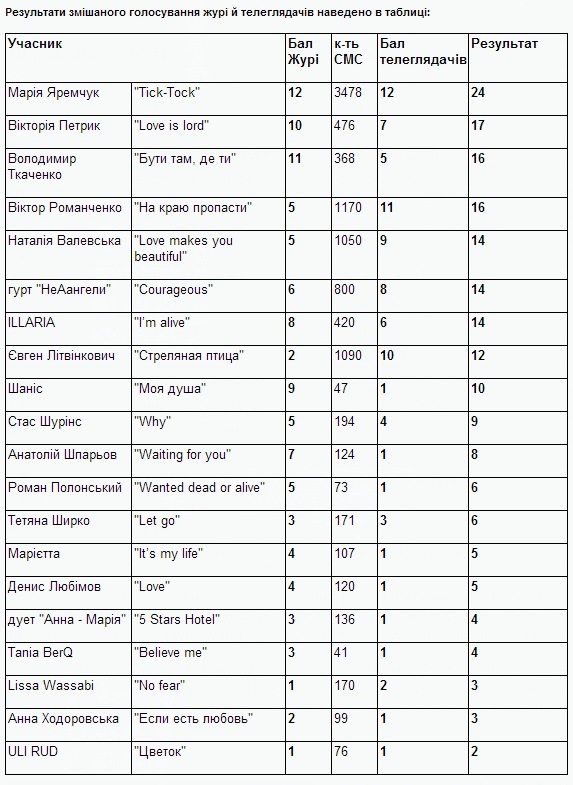 Mariya is not only a singer and a composer. She also loves to photograph and to learn foreign languages: she is fluent in English, Italian and German and wants to learn Hebrew and Eastern languages with different letterforms. Her style and femininity idol is Monica Bellucci. In the music world, Mariya gives the nod to Madonna’s energy and Maroon 5 leader Adam Levine’s voice and sexuality. But all admiration still belongs to Mariya’s true inspiration – her father. Mariya Yaremchuk has specially written song "Tick-Tock" for the Eurovision Song Contest, both music and lyrics in English. "The process of finding the song was very difficult. I listened to a lot of material by other authors but came to the conclusion that I should write my entry myself. I was doing it in terms of force majeure, in a fairly short time. I tried to express myself through the melody and rhythm. And as they say, song has got the 'drive'. The modern world is very dynamic, and sometimes in the race for success, people often lose sight of the most important things. The message of my song is the recalcitrance of love. Love is timeless, it is stronger than everything and everyone! Staging presentation for the national preselection Mariya entrusted to the British choreographer Francisco Gomez, who in Ukraine participated in the project "Tantsyuyut Vsi" as a jury member. said Maria in her first interview given after the national preselection to the website ESCKAZ.com. "Over the next two months we will prepare an improved version specially for the contest. The only thing that will remain untouched in the arrangement - is the presence of Ukrainian national melodics". On January 22, Mariya has loaded couple of short videos of recording of the new arrangement on her Instagram account. The new version was premierred in Malta on February 7, however, faced negative reviews from Eurovision fans. After giving some thoughts about changing the entry completely it was decided to bring in another lyrics and arrangement. Lyrics have been written by Sandra Bjurman (Azerbaijan 2010-2012) and the song has been rearranged in Sweden by Stefan Örn (Azerbaijan 2010-2012, 2014). Music video was shot in March in Kyiv, Ukraine by director Sergey Knyazev. "In the new version of my contest entry "Tick-Tock" were changed lyrics and arrangement. I have wanted for a long time to modify the lyrics, so that they to the fullest extent possible would pass all the sense, all the message, which I put into the song. My song is about time we spend searching for our true love. Life goes so fast and then love hits you in the most unexpected moment! On a modified version of the lyrics was working the famous Swedish singer, composer and lyricist, creator of many previous "Eurovision" hits Sandra Bjurman. 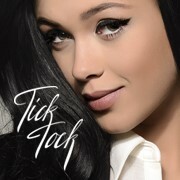 Now "Tick-Tock" seems to me truly integral and finished story"
told Mariya Yaremchuk to ESCKAZ.com. On Friday, April 25th, tendentious Ukrainian participant to the Eurovision Song Contest 2014 Mariya Yaremchuk is going on two-day visit to Athens, Greece. Just days before main event in Copenhagen Ukrainian singer has decided to made her final promotional visit and to meet with Greek fans, press and fellow contestants. Mariya will start her day in a Greek’s capital Athens with MAD TV appearance followed by Mad Radio and Star Channel interviews about her preparation to the Contest and her amazing road to Copenhagen. After that singer set to meet with her fellow contestants – Greek participants Freaky Fortune and RiskyKidd to joint interview for Alpha TV. “I’m so exited to meet with these guys! – said Mariya. – I’ve listened to their song over and over and I want to share my thoughts on it and spend some time with my colleagues before going to Copenhagen“. 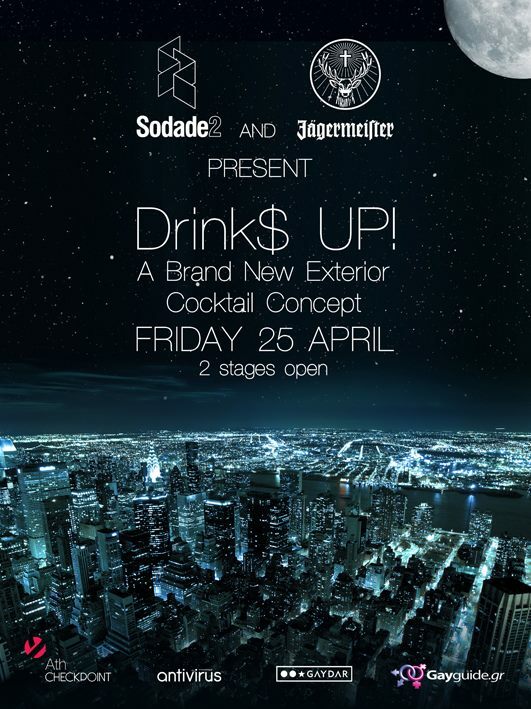 Later this night Mariya is going to perform live at Sodade 2 Club to present her entry song - foot-tapping Tick Tock. Saturday, April 26th, is also filled with appearances, interviews and performances. Mariya is going to meet with Greek outpost for international Eurovision fans community OGAE, talk to press and perform on stage at Shamone Club. Ukrainian singer hopes to spend some free time exploring ancient Athens to lift her spirit up on the way to Copenhagen. Mariya Yaremchuk, Ukrainian entry to the Eurovision Song Contest 2014, has released exclusive official photoshoot. Ladylike and wicked, attenuatous and delicate part of Mariya's complicated style and character find the way to show off in a beautiful photos. “I adore to look for something new in my image, to explore myself, - said Mariya during shooting. - I hope that I will lift a veil a bit under Mariya Yaremchuk for you”. Tomorrow, on April 17, in Kyiv will be held shooting of flash-mob in support of Ukraine for the Eurovision Song Contest 2014. This will be a simple positive video, where each member will be the main hero. We don't need extras - we need really bright cool people. All you need: to be dressed in bright colours, and take with you an ultra-bright umbrellas and similar mood! Additional information - on the Facebook page of the singer. Today, April 16th, Ukrainian representative at the Eurovision Song Contest 2014 young and energetic Mariya Yaremchuk and her team have re-launched her official web-site. Be first to know all the fresh news, watch exclusive videos and listen to Mariya’s entry song - foot-tapping tune Tick-Tock – from anywhere anytime just in one click. This web resource is the first and most important source of info when it comes to Ukraine’s entry to this year’s Contest. Do you want to know where Mariya is performing tonight? Are you hungry to see the hottest videos and check out the newest version of the Tick-Tock? Do you need to stay up-to-date about rehearsals and preparations for the Eurovision Song Contest? Be ready for all the information in one place - MariyaYaremchuk.com, the first destination for fans and press when it comes to Ukrainian fair. For even more on-the-spot information follow Mariya Yaremchuk at social networks: Facebook, Twitter, Youtube, Instagram. 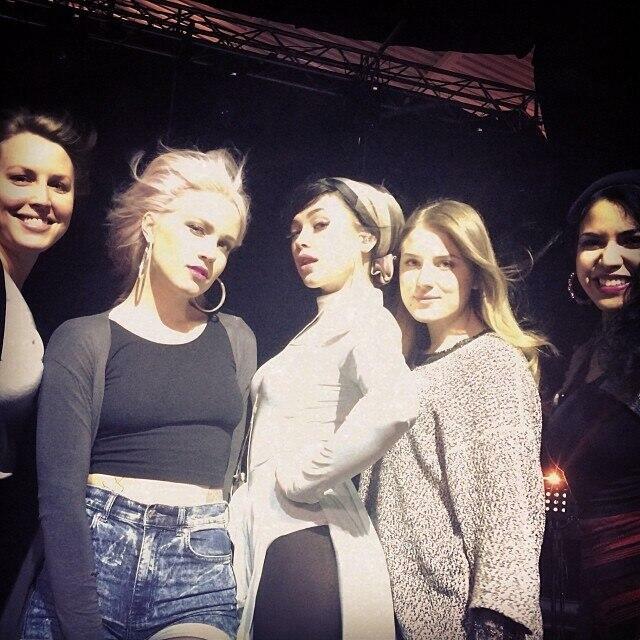 Next event in which Mariya Yaremchuk took part was the London Eurovision party in the capital of United Kingdom. During the party singer has performed two songs: Tick Tock and her new track I Dare To Dream and gave one more interview to ESCKAZ.com website. In it she confirmed that unlike at the national final, she will not be working on choreography with British Francisco Gomez, as well as that performance in Copenhagen will have nothing to do with the performance shown last week in Amsterdam. ESCKAZ.com was priveleged to record two interviews with Mariya Yaremchuk during Eurovision In Concert in Amsterdam: in English and in Russian. "We have finalized, polished the song. This year's Eurovision symbol is a diamond, and the song, too, needs also to be polished like a diamond so that it flashes," Mariya said, promising, however, that version of the song that was performed in the Maltese selection will also be included in the promo CD of the singer. "I want to breathe life into the song, the outfits will not be the same as in the music video, the concept has been already invented and costume is ready." This Saturday, April 5th, Ukrainian participant at the Eurovision Song Contest 2014 Mariya Yaremchuk is going to take part in the largest Eurovision promotional event “Eurovision in Concert” annual show in Amsterdam. On stage of Amsterdam's most famous music venue, the Melkweg, Mariya will perform her vibrant entry song Tick-Tock. It was a long-time dream for Mariya to visit the Netherlands and especially Amsterdam. "I hope that you all will be very surprised by our stage presentation, we are now working very hard on something, that you can not even imagine. I'll say this: it will be radically different interpretation of the song, unexpected even for myself"
"I love the songs in Eurovision this year, especially ballad songs. So much depends though on how it will look visually. It is too early to draw conclusions, but as a listener I am pleasantly surprised, and as a contestant I feel respect for my colleagues"
"I consider as my biggest rival myself. You can not imagine how difficult it is sometimes to overcome myself. Even not a fatigue and laziness, but the internal walls that you build for a whole a lifetime. It is necessary to become the way you are - a real and truthful. Hardest thing that I pass through now now - it's a fight with myself. And if my light side will win - this is the main goal for me"
"There is fear before the performance, as every singer has it. Closer contest is, the more jitters there are. I try to reject such thoughts - the practice destroys any fear. You feel comfortable when you practice a lot. But I had no desire to reject participation at all, because it was something I dreamed about it for a long time". "With a pure sole, I can tell that I'm not responsible for financing issues, because I do not enough space in my head to follow these processes as well. I should perform my own task well. And my task is to sing. This is on the first place"
"There are more important things than politics. This contest is a competition between vocalists. This is festival. Naturally, people decide how to vote. I would like to believe that the politics will be held at a distance from the Eurovision Song Contest"
"I really wanted to change my contest entry, because today I want to sing about serious things, and it is difficult for me to perform funny tunes when there is such a situation in the country. However, I was unable to replace the song since the rules prohibit such things. But now I have a song that almost was sent to me from heaven, it shows what happened in our country. It has no polititcs and has faith in it. This song is a confession. I will sing this song live during my promotional tour in Europe, but unfortunately, it will not be my contest entry. I confess that at some point I had the feeling even to withdraw from theEurovision Song Contest, but it would be wrong. We need to think less on how we will be accepted there, but to do more in order to be accepted well", said Maria Yaremchuk in her recent interview with "KP" newspaper. On March 3 Mariya Yaremchuk has released new music video for the song "Bez tebya" (Without you). Song, written by Oksana Kirilyuk was originally released by Mariya in 2012. Music video, directed by Dmitry Peretrutov, includes shortened and rearranged version of the song. Before that, in 2007, the song became a dispute between another Ukrainian singers Rostislav Todoresku and Anna-Maria, who both were claiming rights for it. Representative of Ukraine Mariya Yaremchuk became a blood donor. She was one of many of citizen of Kyiv, willing to donate blood for the victims of clashes taking place in Ukrainian capital these days. Singer has published photo of her card of donor in her instagram account saying: "I'm to tears penetrated by proud for the Ukrainian nation! I had to stand in long queue to donate my blood! There were 350 people willing to become donors today! There still is hope, as long as there is compassion and the human soul is not yet petrified! Glory to Ukraine!" "I cannot calmly react to what is happening now. My heart is bleeding... I feel it is a nightmare and I hope with all my heart that God will have a mercy on our suffering people! Situation in Kiev reminds Apocalypse... The people are divided into patriots and traitors, and no one can distinguish one from the other... We are brothers in blood and in fate, and I'm totally against the bloodshed and violent combat methods. Let God help the Ukrainian people to survive! Glory to Ukraine! And finally I want to say that I'm getting many messages with questions whether it is true that I expressed support to some political forces. This is a complete disinformation! And it hurts me to read such a false headlines! I'm with Ukraine!" As we have already reported, Mariya Yaremchuk has performed as special guest at semifinal of national Maltese preselection for Eurovision Song Contest 2014. Together with Mariya to Malta came also vice director general of NTU Victoria Romanova. Victoria these days was taking part in the meetings of Reference Group of Junior Eurovision Song Contest in Malta. "I am amazed at the level of the Maltese show. National selection in this country is made of two parts - the semifinal and final. Besides the fact that both concerts are held on the big stage in front of several thousand spectators, the show is also broadcasted live. I noticed that the national selection for the Eurovision Song Contest is the most popular music event in Malta, and for two evenings the whole country was attracted to television screens. So for me it was a great honor to be invited to the jury in such a remarkable event. I wish the winners - band Firelight successful performance in Copenhagen". Ukrainian entry for the Eurovision Song Contest 2014 was chosen via a traditional morning-time national final, aired on First National channel on December 21, 2013 live from NTU studio in Kyiv. The show was hosted by Timur Miroshnychenko and Tetiana Terekhova with Igor Posypaiko interviewing artists in the green-room. "There exists a profound misconception that it is necessary to try to influence, to put pressure on the members of the jury. One shouldn't attempt doing that, but just show a powerful performance. NTU now faces challenge to select a worthy representative of Ukraine, which would favorably affect the country's image in the eyes of the international community. ... My advice to everyone is to spend efforts on vocal lessons, invest the soul, heart and emotion in the music that you want to show Europe, search for good production studios and consult with the competent choreographers and directors. Admin resource is good thing, but when it comes to the selection of representative of the country at the prestigious international arena - NTU in recent years has been doing everything in order to ensure having a worthy choice, because it is directly related to television ratings and prestige of the broadcaster." After the show several participants have accused organizers in breaking the regulations devoted to the composition of the national jury, prescribing jury line-up to be varied in age and genre (all jury members were male) and prohibiting of participation in jury persons involved in juries of national preselection of the past 2 years (Yuriy Rybchinskiy was jury member in 2012 preselection). NTU has not made any statement in this regards. 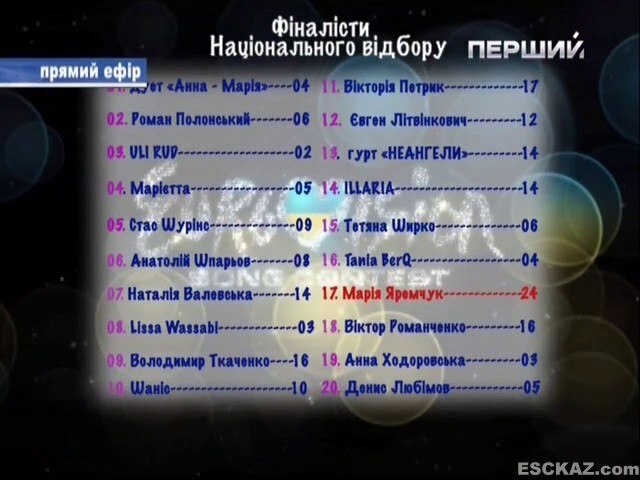 Additionally, some of participants have accused winner of the show Mariya Yaremchuk and several other participating artists in manipulating televoting results. Olyona Mozgova, manager of participant Volodimir Tkachenko (who finished 3rd) has lead the protests and promised: "Our lawyers and IT specialists are now preparing documents to prove the scheme of manipulation of televoting". She has been joined in statements by Yuriy Nikitin, manager of "neAngely" duet (finishing 5th) saying: "Not all televotes were calculated, our specialists have noticed untypical raise of the votes of several contestants, while lines of others were blocked" and and Igor Petryk, father and manager of singer Viktoriya Petryk (runner-up of the selection and winner of the vote of accredited at the show representatives of mass-media) saying "Money were withdrawn from the phone balance of our voters, but their votes have not been calculated". It was announced later that Victoriya Petryk will try to enter Russian preselection for Eurovision 2014. Мария поет с шести лет; активно участвует в песенно-творческом процессе в Украине; лауреат многих конкурсов и фестивалей, в том числе - Всеукраинского фестиваля искусств "Будущее Украины - дети" (2003), премия и приз зрительских симпатий. В 2009 году она закончила гимназию № 4 города Черновцы и поступила в Киевскую муниципальную академию эстрадного и циркового искусств им. Л. О. Утёсова на класс эстрадного вокала. Она также заочно окончила факультет истории и политологии международных отношений Черновицкого государственного университета по специальности "Международные отношения". Известность к Марии пришла с участием в проекте "Голос країни", где она попала в команду к Александру Пономарёву (участнику Евровидения 2003), дошла до финала и заняла 4-е место. В 2012 году певица стала единственной представительницей от Украины на конкурсе "Новая Волна 2012", где в итоге заняла третье место и получила приз зрительских симпатий. Осенью 2012 года представила сингл "Со мной опять", написанный Константином Меладзе и Андреем Французом, и видеоклип на эту композицию. В прошлом году Мария уже принимала участие в национальном отборе Украины на конкурс Евровидение с песней собственного сочинения "Imagine", где заняла 5е место. Осенью 2013 года презентовала видеоклип на композицию "Тебе я знайду". Мария не только певица и автор песен. Она также любит фотографировать и изучать иностранные языки: она в совершенстве владеет английским, итальянски и немецким и хотела бы выучить иврит и восточно-европейские языки. Ее кумир в стиле и женственности - Моника Беллуччи. В музыкальном мире Мария преклоняется перед энергией Мадонны и голосом и сексуальностью лидера Maroon 5 Адама Левайна. Но все равно основным предметом восхищения и источником вдохновения для Марии остается творчество ее отца. Мария Яремчук специально написала песню "Tick-Tock" для конкурса Евровидение, как музыку, так и текст на английском языке. "Процесс поиска песни был очень сложным. Я переслушала массу материалов других авторов и пришла к выводу, что должна написать сама. Делала это в условиях форс-мажора, поскольку сроки довольно сжатые. Я попыталась выразить себя через мелодику и ритм. И, как говорят слушатели, песня получилась 'драйвовая'. Современный мир очень динамичный, и иногда в гонке за успехом, люди забывают о более важных вещах. Моя песня - о непокорности любви. Любовь не имеет временных границ, она сильнее, чем всё и все! Постановку своего конкурсного номера для национального отбора Мария доверила британскому хореографу Франциско Гомесу, который в Украине принимал участие в проекте "Танцюють всі" в качестве члена жюри. заявила Мария в своем первом интервью после национального отбора, данном сайту ESCKAZ.com. "За два ближайших месяца мы подготовим усовершенствованную версию специально для Евровидения. Единственное, что останется неизменным в аранжировке – это присутствие украинского национального мелоса". 22 января Мария загрузила несколько коротких видео с записи новой версии Tick Tock на свой аккаунт в Instagram. Премьера новой версии песни прошла на Мальте 7го февраля, однако, она встретила негативные отзывы от поклонников Евровидения. После обдумывания возможности полностью заменить песню, было решено поменять только текст и аранжировку. Новый текст написала Сандра Бьюрман (Азербайджан 2010-2012), а аранжировку сделал в Швеции Стефан Ёрн (композитор Азербайджана 2010-2012, 2014). Видеоклип на песню был снят в Киеве, режиссер Сергей Князев. "В новой версии моей конкурсной песни «Tick-Tock» изменились слова и аранжировка. Я давно хотела доработать слова песни, чтобы они как можно полнее передавали весь тот смысл, весь посыл, который я вкладывала в композицию. Это песня о поиске настоящей любви, о том, сколько нужно времени и сил, чтобы ее действительно обрести, а когда она наконец-то появляется в нашей жизни, то все равно становится полной неожиданностью. Над измененной версией слов песни работала известная шведская певица, композитор и автор текстов, создательница многих хитов предыдущих конкурсов «Евровидение» Сандра Бьюрман. Теперь "Tick-Tock" кажется мне по-настоящему целостной и законченной историей"
В пятницу, 25 апреля представительница Украины на Евровидении 2014 Мария Яремчук отправится с двухдневным визитом в Афины, Грецию. За несколько дней до главного мероприятия в Копенгагене украинская певица решила совершить свой последний промо-визит и встретиться с греческих фанатами, прессой и коллегами-конкурсантами. Мария начнет свой день в столице Греции Афинах с появления на телеканале MAD, а также на Mad радио и Star Channel, где даст интервью о своей подготовке к конкурсу. После этого певица намерена встретиться с представителями Греции Freaky Fortune feat. Riskykidd в совместном интервью для Альфа ТВ. "Я так рада возможности встретиться с этими парнями! - говорит Мария. - "Я слушала их песню снова и снова, и я хочу поделиться с ними своими мыслями о ней, и провести некоторое время со своими коллегами еще до того, как мы отправимся в Копенгаген". Позже в эту ночь Мария собирается выступить в ночном клубе Sodade 2, где представит свою песню Tick-Tock. Суббота, 26 апреля, также наполнена выступлениями и интервью. Мария собирается встретиться с членами греческого фан-клуба Евровидения и выступить на сцене в Shamone Club. Украинская певица надеется провести свободное время, изучая древние Афины, чтобы поднять свой дух по дороге в Копенгаген. Мария Яремчук, украинская участница Евровидения 2014 года, выпустила эксклюзивную официальную фотосессию. Женственная и опасная, изящная и деликатная - это части сложного стиля и характера Марии. И все же фотограф смог найти способ показать это в хороших фотографиях. "Я обожаю искать что-то новое в своем образе, изучать себя, - сказала Мария во время съемки. - Надеюсь, что этими фото я буду немного приподнимать завесу над тем, кто такая Мария Яремчук для вас." Завтра, 18 апреля, в Киеве пройдет съемка флеш-моб видео в поддержку Украины на Евровидении. Это простое доброе позитивное видео, где каждый участник становится главным героем. Нам не нужна массовка. Нужны действительно яркие классные люди. Все, что от вас требуется: быть одетым в яркие цвета, иметь при себе супер-яркий зонтик и такое же настроение! пятница с 15:00 до 18:00 на Софиевской площади. Дополнительная информация - на фэйсбук-странице певицы. Сегодня, 16го апреля, представительница Украины на Евровидении 2014 молодая и энергичная Мария Яремчук и ее команда перезапустили официальный вебсайт. На нем вы сможете первыми узнать свежие новости, увидеть эксклюзивные видео и услышать песню Марии - зажигательную Tick-Tock из любого места и в любое время. Этот ресурс призван стать первым и самым важными информационным источником информации, которая относится к подготовке Украины к Евровидению этого года. Вся информация - в одном месте - MariyaYaremchuk.com. Также самую оперативную информацию о Марии Яремчук можно получать в социальных сетях: Facebook, Twitter, Youtube, Instagram. Очередным мероприятием, в котором приняла участие Мария Яремчук - стала вечеринка London Eurovision в столице Великобритании. В рамках данной вечеринки певица исполнила две композиции: Tick Tock и новую песню I Dare To Dream и дала новое интервью вебсайту ESCKAZ.com. В нем она рассказала, что в отличии от национального отбора она не будет работать над подготовкой номер с британским хореографом Франциско Гомесом, не будет исполнен в Копенгагене и номер, который был ранее представлен в Амстердаме. В Амстердаме ESCKAZ.com взял два интервью у представительницы Украины Марии Яремчук: на английском и на русском языках. "Мы доработали, дошлифовали песню. В этом году символ Евровидения - бриллиант, и песню тоже нужно также отшлифовать, как бриллиант, чтобы она засверкала", сказала Мария, пообещав, однако, что версия песни, прозвучавшая на Мальтийском отборе также войдет в промо-диск певицы. "Мне хочется вдохнуть в песню жизнь, костюм будет не таким, как в клипе, концепция уже придумана и костюм уже пошит". 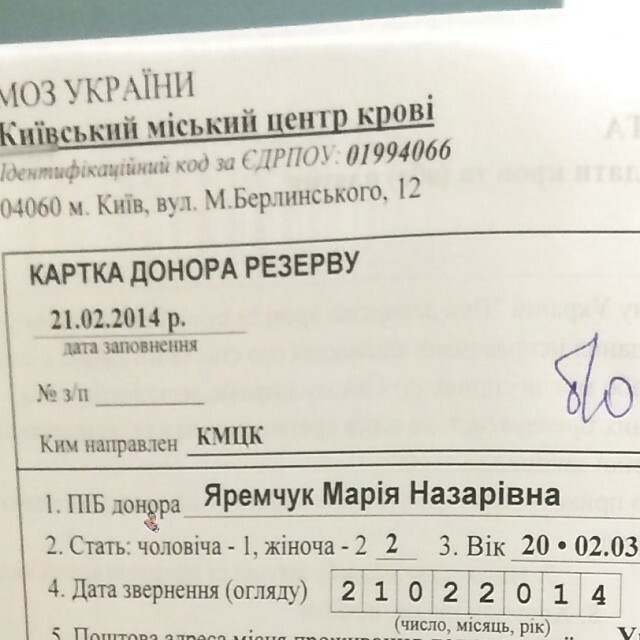 В эту субботу, 5го апреля, представительница Украины на Евровидении 2014 Мария Яремчук примет участие в крупнейшем промо-мероприятии перед Евровидением - ежегодном шоу "Eurovision in Concert" в Амстердаме. На сцене знаменитого концертного зала Melkweg, Мария исполнит свою песню Tick-Tock. Мечтой Марии давно уже было посетить Нидерланды и их столицу. "Я надеюсь, что вас очень удивит наш номер, мы сейчас очень плотно работаем над тем, что вы даже представить не можете. Скажу так: это будет кардинально другое прочтение песни, неожиданное даже для меня"
"Мне очень нравятся песни в этом году, особенно балладные песни. Поэтому очень многое зависит от того, как это будет выглядеть визуально. Выводы делать рано, но как слушатель я приятно удивлена​​, а как конкурсантка – чувствую уважение к своим коллегам"
"Я считаю главным конкурентом себя. Вы не представляете, как иной раз сложно побороть себя. Даже не усталость и лень, а именно свои внутренние стены, которые ты строишь всю жизнь. Нужно стать таким, какой ты есть настоящий и правдивый. Самое сложное я прохожу сейчас – это этап борьбы с собой. Если моя светлая сторона победит – это для меня главная цель"
"Страх, конечно, есть перед выступлением, как и у каждого певца. Чем ближе конкурс, тем больше мандраж. Я стараюсь отбрасывать такие мысли – практика уничтожает любой страх. Ты чувствуешь себя комфортно, когда много практикуешься. Но желания отказаться от участия вообще не было, потому что я очень долго об этом мечтала"
"Я с чистой душой могу вам сказать, что не отвечаю за вопросы финансирования, потому что не хватает места в голове, чтобы следить и за этим процессам. Я должна выполнить свою задачу хорошо. А моя задача – петь. Это на первом месте"
"Есть более важные вещи, чем политика. Это конкурс, это борьба вокалистов. Это фестиваль. Естественно, народу решать, как голосовать. Хотелось бы верить, что политика будет присутствовать в дали от конкурса Евровидение"
"Мне очень хотелось поменять конкурсную песню, потому что хочется сегодня петь о серьезных вещах и трудно исполнять веселые вещи, когда такое творится в стране. Увы, изменить песню мне не удалось, правила конкурса подобные вещи запрещают. А ведь у меня есть песня, которая была мне словно послана с небес, она отображает то, что произошло в нашей стране. В ней нет политики и в ней есть вера. Это песня – исповедь. Я буду петь эту песню на концертах в предконкурсном туре по Европе, но жаль не как конкурсную композицию. Признаюсь, в какой-то момент у меня было такое настроение, что я даже подумывала и вовсе не отказаться от участия в Евровидении, но это неправильно. Нужно меньше думать, как нас примут и больше сделать для того, чтобы приняли хорошо", рассказала Мария Яремчук в интервью "КП". 3го марта Мария Яремчук выпустила новый видеоклип на песню "Без тебя". Композиция, написанная Оксаной Кирилюк, была впервые выпущена Марией в 2012 году. Видеоклип, режиссером которого стал Дмитрий Перетрутов, включает укороченную версию песню в новой аранжировке. Ранее, в 2007 году эта же композиция стала причиной спора между другими украинскими исполнителями - Анной-Марией и Ростиславом Тодореску, каждый из которых исполнял ее и заявлял об обладании правами на нее. Представительница Украины Мария Яремчук сдала кровь для пострадавших на Майдане. Она стала одной из многих жителей Киева, желающих сдать кровь для жертв столкновений, происходяших в настоящие дни в столице Украины. Певица опубликовала фото своей карты донора в своем аккаунте в instragram, написав: "Меня до слез пробирает гордость за украинский народ! Мне пришлось выстоять длинную очередь, чтобы сдать кровь! 350 желающих стать донорами за сегодняшний день! Надежда есть, пока есть сострадание и пока человеческая душа не окаменела! Слава Украине!" "Не могу спокойно реагировать на то, что происходит сегодня! Сердце обливается кровью... кажется , что все это - страшный сон и я всей душой надеюсь, что Господь смилуется над нашим страждущим народом. Ситуация в Киеве напоминает Апокалипсис... Народ разделился на патриотов и предателей, и никто не в силах отличить одного от другого... Мы братья по крови и по судьбе, и я категорически против кровопролития и силовых методов борьбы. Дай Бог украинскому народу выстоять! Слава Украине! И напоследок хочу сказать, что получаю множество сообщений с вопросами правда ли то, что я выразила определенную поддержку политическим силам. Это сплошная дезинформация! И мне больно читать ложные заголовки! Я с Украиной!" Как мы уже сообщали, Мария Яремчук выступила в качестве гости на полуфинале национального мальтийского отбора на конкурс Евровидение 2014. Вместе с Марией на Мальте побывала и заместитель генерального директора Национальной телекомпании Украины Виктория Романова. Виктория принимала в эти дни участие в заседаниях организационной группы конкурса "Детское Евровидение". "Я поражена уровнем мальтийского шоу. Национальный отбор в этой стране предполагает 2 части – полуфинал и финал. Кроме того, что оба концерта проводятся на большой арене в присутствии нескольких тысяч зрителей, шоу также транслируются в прямом эфире. Хочу отметить, что национальный отбор на Евровидение является самым популярным музыкальным событием на Мальте, и в течение двух вечеров вся страна была прикована к телеэкранам. Поэтому для меня – большая честь быть приглашенной в состав жюри на такое масштабное замечательное событие. Желаю победителям – группе Firelight удачного выступления в Копенгагене". Представитель Украины на конкурс Евровидение был выбран в рамках уже традиционного утреннего отборочного шоу, показанного на Первом Национальном телеканале Украины 21го декабря 2013 года в прямом эфире из студии НТКУ в Киеве. Ведущими шоу были Тимур Мирошниченко и Татьяна Терехова, а Игорь Посыпайко брал интервью у артистов в гринруме. "Cуществует глубокое заблуждение, что нужно обязательно влиять, давить на членов жюри. Этого не нужно делать, лучше выйдите на сцену и просто сделайте мощный перформанс. У НТКУ нынче стоят задачи отобрать достойного представителя Украины, который бы благоприятно влиял на имидж страны в глазах международной общественности. ... Мой совет: тратьте усилия на уроки вокала, вкладывайте душу, сердце и эмоции в ту музыку, что вы хотите показать Европе, ищите хорошие студии и консультируйтесь у грамотных хореографов и постановщиков. Админ-ресурc это конечно хорошо, но когда речь идет о представителе страны на престижной международной арене – НТКУ последние годы делает все для того, чтоб выбор был достойным, т.к. это напрямую связано с рейтингами и весом телекомпании". После шоу ряд исполнителей обвинили победительницу отбора Марию Яремчук и еще нескольких других участников в фальсификации результатов телеголосования. Возглавила протесты продюсер конкурсанта Владимира Ткаченко (занявшего 3е место) Олена Мозговая, пообещавшая:"Наши юристы и IT специалисты готовят документы, которые покажут и докажут "схему" "честного" голосования". В заявлениях к ней присоединились Юрий Никитин, продюсер дуэта "НеАнгелы" (занявшего 5го место), заявивший: "Наши специалисты зафиксировали нетипичный рост количества голосов у одних участников и блокировку голосования у других" и Игорь Петрик, отец и продюсер певицы Виктории Петрик (серебрянного призера отбора и победителя голосования представителей аккредитованных на отборе СМИ): Люди отправляли смс, деньги с их счетов снимались, но эти голоса уходили непонятно куда. Позднее было объявлено, что Петрик попробует принять участие в Российском национальном отборе на Евровидение 2014.